To sacrifice something is to give it away, often to prevent a larger evil or to achieve a greater benefit. In primitive cultures where the word originated, it means you make something sacred by dedicating it to the gods for their use alone. You do this typically by preventing it ever being used by anyone else, i.e. you kill it or destroy it. It may be a young child, or a prisoner, or a prized horse or farm animal, or a sword or jewelry. You invoke the gods, then kill or break the sacrifice, or throw it somewhere irretrievable like the sea or a volcano. 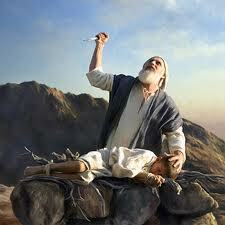 God said to Abraham, "Kill me a son." A seven-year-old Indian girl was murdered in a tribal sacrifice and her liver offered to the gods to improve crop growth, police in the central state of Chhattisgarh said on Sunday. The body of Lalita Tati was found in October a week after her family reported her missing. “A seven-year-old girl was sacrificed by two persons superstitiously believing that the act would give a better harvest,” Narayan Das, the police chief of Bijapur district, told AFP by telephone. So what words come to mind? “Murder… tribal… black magic… witch doctors…”? Yes, those all show up in the rest of the story as reported. But how about “Abraham… God… sacrifice…”? Sacrifice is nothing more than an attempt to bribe the most powerful force you can conceive of, so that it will reward you instead of punishing you. It makes ‘love of God’ into a mere manifestation of the Stockholm Syndrome. The Roman Empire, although hosting gladiatorial contests and public executions, found human sacrifice obnoxious “to the laws of gods and men”. That the three great monotheist religions trace their common ancestry to Abraham, and to his willingness to kill his son in order to appease the voices in his head, is not something that any Jew, Christian or Muslim should be proud of. This entry was posted in Religion, Society and tagged Abraham, Christianity, Islam, Judaism, magic, monotheism, polytheism, Romans, sacrifice, tribalism.